New York : Berkley Books, 2009, c2008. Ttown mayor Emily receives an unexpected and precious Christmas gift on her doorstep: a baby girl. As the police search for the mother who abandoned the infant, Emily gains temporary custody of infant Jane and begins to wrestle with her yearnings to raise the child herself. Her husband, Dan, struggles with his own mixed feelings about the adoption. 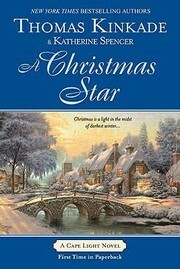 A Christmas star / Thomas Kinkade & Katherine Spencer. $c Statement of responsibility Thomas Kinkade & Katherine Spencer. 250 Edition $a Edition statement Berkley trade paperback edition. $c Date of publication, dist, etc 2009, c2008. 500 General Note $a General note "A Parachute Press book.". 520 Summary Etc. $a Summary, etc. note Ttown mayor Emily receives an unexpected and precious Christmas gift on her doorstep: a baby girl. As the police search for the mother who abandoned the infant, Emily gains temporary custody of infant Jane and begins to wrestle with her yearnings to raise the child herself. Her husband, Dan, struggles with his own mixed feelings about the adoption. 655 0 $a Christmas stories. 655 0 $a Domestic fiction. 655 7 $a Domestic fiction. 655 7 $a Christmas stories. 655 7 $a Christian fiction.